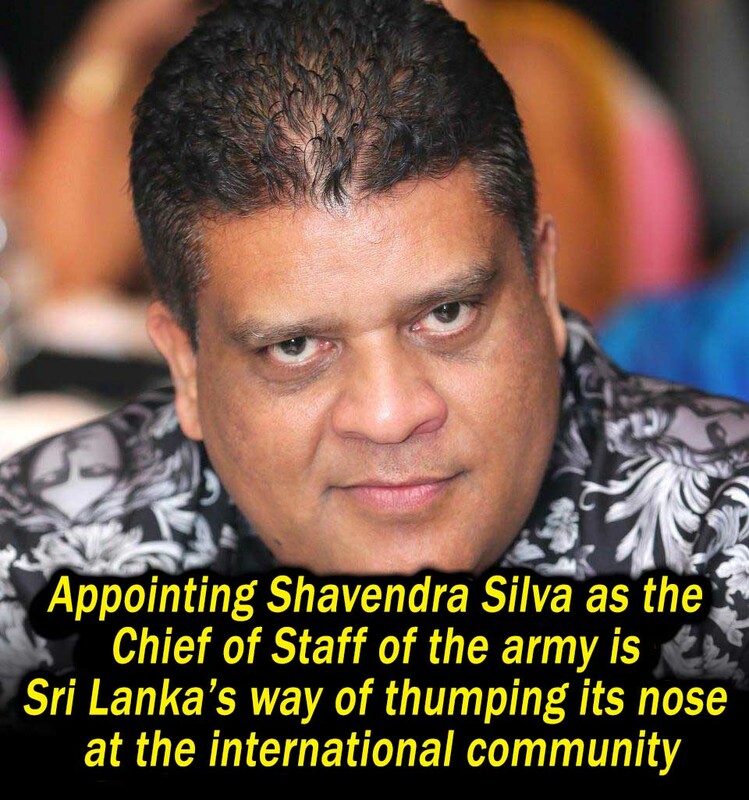 (Lanka e News - 12.Jan.2019, 11.30PM) The recent appointment of Shavendra Silva (Silva) as the Chief of Staff of the Sri Lankan army has sent shock waves through the Tamil community, and to all those interested in human rights and accountability in Sri Lanka. Such appointment, particularly as Sri Lanka’s human rights record is about to be reviewed in Geneva in March 2019, is a clear message to the international community that the country cares little about its views and the potential consequences of its failures in faithfully implementing the UNHRC resolution 30, 34/1. Among all the Sri Lankan military officers implicated in war crimes, Silva is perhaps the most well-known. In many ways, he symbolised war crimes and crimes against humanity committed by the Sri Lankan armed forces during the last stages of the war and the extent to which the country is prepared to hide and protect its military from honest scrutiny and accountability. Brigadier Silva was the General Officer Commanding of the military’s controversial 58th Division that battled the LTTE in the Vanni in the final days of the conflict. There are multiple reports that strongly implicate Silva with war crimes. The UN Panel of Experts Report (2011) alleged that it was in surrendering to his Division that several LTTE members were shot dead (the infamous ‘White Flag Case’). According to the South Africa based International Truth and Justice Project (ITJP - 2018), eye witnesses placed Silva on site and claim he even shook hands with the LTTE political wing leaders who surrendered on 18 May 2009, only to be summarily executed shortly thereafter. It has called on the Office of the Missing Persons (OMP) to investigate this as the first case if it was serious about criminal accountability for enforced disappearances, and for Major General Silva to be questioned first. Troops under his command were also credibly accused of shelling hospitals and no-fire zone packed with women, children and elderly refugees. When Silva was appointed as Sri Lanka’s Deputy Permanent Representative to UN in August 2010, it was viewed not just as Sri Lanka’s attempt to give the highest protection to the most notorious of its military officers, but also as a test of the international will with regards to the extent of their commitment in ensuring war time accountability. During his UN tenure, a law suit was filed against Silva by the relatives of Tamil victims in the District Court of the Southern District of New York, which as expected, Silva fended off invoking diplomatic immunity. Though the original attempts at preventing Silva’s appointment to the UN failed, a consolation of some sorts was achieved when Silva was debarred from participating in meetings of the Special Advisory Group related to UN peace keeping missions of which he was a member representing the Asian group of countries. The chairperson of the Group, Louise Frechette, a former UN Deputy Secretary General, informed Silva that his participation in the Group was ‘inappropriate’ and advised him to keep away from all ‘deliberations’ of the panel. Despite these setbacks, the rise and rise of Silva in the ranks of the Sri Lankan army continued unabated after his return from New York – first promoted as Adjunct General, Director of Operations and now a General and the army’s Chief of Staff. None of this is surprising, and indeed expected, by those who intimately understand Sri Lanka’s real lack of commitment to address criminal accountability involving its armed forces, particularly those prominent officers often venerated as war heroes despite their despicable record. The question is how the international community will face up to these challenges when Sri Lanka once again reports its progress on implementing resolution 30, 34/1 in March 2019, when it will have nothing to report on the criminal accountability of its armed forces. The Silva episode must be one important factor when UNHRC member countries decide on appropriate responses and setting up mechanisms to achieve accountability and reconciliation in Sri Lanka for the post March 2019 period.